The organ, bought from Magdalen College Oxford, has a single manual and was built by Gray and Davidson; the pedal board is unusual in having the pedals arranged in parallel instead of radially. The altar table, with a painted wooden frontal, also came from Oxford, from Balliol. There is a ring of 8 bells, two of them pre-Reformation, the treble and second dating from 1950, while the original 6 range in age from 1848 for the 3rd, 4th and 5th to 1656 for the 6th and the late 15th century for the 7th and tenor; the latter weighs 13.5 cwts. The clock, blacksmith made in about 1700 or a little earlier, has neither hands nor a dial and was made to strike the hours on the hour which it still does by pulling the necessary number of times on a hammer which strikes the tenor bell. The clock has a two train movement in a "bird cage" frame which was commonly used from the last quarter of the 17th century and throughout the 18th. Both trains are powered by weights giving a little over 24 hours running necessitating winding daily, a task still done by hand; volunteers are always welcome to join the rota for this purpose. The clock, which was neglected from the outbreak of 2nd World War until it was restored in 1982, is now located on a new frame on the recently built mezzanine floor in the tower where it can readily be seen in action. On display are plans of the church, churchyard with numbered references to the headstone inscriptions, together with a list of past Rectors and Vicars dating from 1299 when Edward I was king. The sun-dial over the south porch was added to celebrate the Millennium. The Parochial Church Council has adopted a policy whereby the church will embrace community use and to that end the pews at the rear of the nave have been removed and the floor there levelled to provide an open space for social occasions. As a result of the generosity of many villagers 50 upholstered chairs were recently purchased to provide additional seating when required. A hearing loop and sound enhancement system have recently been installed and a professional recording of our organist Paul Cheater made so that a library of hymns and other music can be played at St Mary’s, and other churches in the Bride Valley, in the absence of an organist. To complete the policy the redundant hall was demolished, to provide some car parking space and to create a vehicular access to the churchyard, and the tower has been reordered, to provide a WC and small kitchen facility on the ground floor with a staircase to a new mezzanine floor above. They are rung every Sunday morning before the service and for weddings and other notable occasions. Also, on Tuesday evenings, the bell ringers spend an hour practising. The bells were refurbished in 2016 by John Taylor & Co of Loughborough. The following extract below is taken from “The Valley of the Bride” by Canon Daniell, Rector of Litton Cheney in the summer of 1950. The parish church of St. Mary, stands in a commanding position. 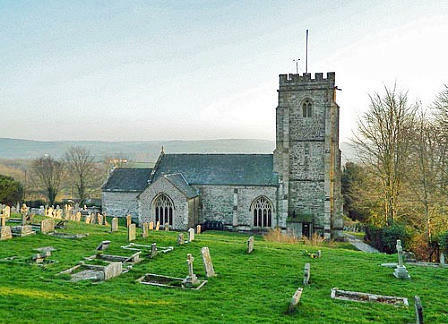 Its square stone tower, characteristic of Dorset churches, has stood the south-westerly gales of 500 years or more. Its six bells are mellow and well hung. Two of them are Pre-Reformation, which is an unusual possession. Legend holds that when Long Bredy was in low water, financially, Litton bought their bell! Happily there is no ill-feeling about it for it happened a long time ago. The Tenor and 5th bells were cast in Exeter about A.D. 1500 and so they were rung by the monks before the Reformation, and before Shakespeare was born. They have been rung down the centuries for victories, coronations, weddings, funerals and for daily worship. The Latin inscriptions on the Tenor Bell, the Mary Bell, may be translated thus - "Truly under heaven there is no sweeter bell than I", and on the 5th bell, the 'Peter' bell from Long Bredy, "JESÚS, His name is given in reverence ". The fourth bell was cast in 1656 and is inscribed with the name of the Churchwarden—"Andru Churchel ". Sir Winston Churchill, ancestor of Britain's greatest son came from Lyme Regis. Can Litton claim any link? We, at least, like to think so. In 1848 two bells were re-cast and a new one, the Treble, added, the gift of the Rector the Rev. James Cox. The Octave is to be completed this year by the gift of two bells, one in memory of a resident's son, Lieutenant Kenneth James Harper R.N., who gave his life in H. M. Submarine Thistle in 1940. The other in memory of Harry Ford Greening who was born and bred in Litton and loved his old Parish Church. Have you ever considered the message bells convey? To me our Octave will suggest—"The joy of the Lord is your strength” . The captain of the tower will welcome any visiting ringer to 'take a turn'. The Litton Cheney ringers are a mixture of ages and experience. For those wishing to learn how to ring tuition is provided. Children can learn to ring as soon as they are strong enough to pull a bell. At the Thorner’s school services at the start and end of each term, four of the children welcome the rest to the service by chiming the four lightest bells under instruction from some of the regular bellringers. 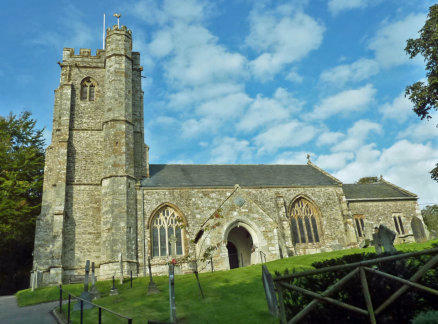 As the Canon wrote more than 60 years ago, there is no ill-feeling over the transfer of the bell from Long Bredy to Litton Cheney but the story still resonates between the villages. One of our lady ringers, Lesley Salvetti, commented: “When I ring, I do sometimes think about the number of people over the centuries, who have rung the bell I am ringing. I feel I am taking my place in history”. The Parish Church, dedicated to St Mary, is a fine Grade 1 listed building standing in a commanding position overlooking the village. The oldest remaining parts of the church are sections of the nave, including the south doorway and the porch which were probably built early in the 14th century. Late in that century the chancel was rebuilt. The north and east walls were rebuilt yet again early in the 19th century. The tower is of late 14th or 15th century when much of the nave, including the chancel arch, was built. The church was restored in1878 when the north chapel, now the vestry, was added. From the Western Gazette of the 31st of May 1912 LITTON, CHENEY Bell Restoration: The bells in the Parish Church tower, which have been restored and rehung at a cost of about £50, were formally re-opened on Thursday last week. The fifth bell, one of the two of the pre-Reformation period in the tower, has been restored at the expense of Mr. C. Fry, as a memorial to his late father Mr. T. Fry. The bells were put to the test at their formal opening on Thursday last, when an enthusiastic team from Bridport and the neighbourhood visited the village and delighted the countryside with the sweet music of the bells. A full peal of grandsire doubles was rung by the following team of ringers: Messrs. W. S. B. Northover, J. Zeallv, F. Powel, J. Tompkins (Bndport), Beans, and Lathey (Bradpole).